It’s a nice chassis and handles well, but it needs a more powerful engine and stiffer engine mounts. I haave had a million hot hatches, and this is fun when all things considered, but super fast it ain’t. I have done 110,000 miles in the Ignis Sport. Have owned over 20 cars before - Alfa (1.3-1.5-1.7-2.0-2.5-3.0-2.5), BMW (3.0), Ford, Citroen, Fiat, Renault, Subaru, Rover, Peugeot (including 16v 106 Rallye) and currently have the Suzuki, a 3.0 BMW and a 3.0l Subaru and the Ignis is really, really fun. Every drive is 100+ smiles per mile. I regularly do 300 miles a day in it, and b-roads are awesome. Excellent little chicken-chaser. Itg profilter fitted and 45kg removed ie. Rear seats, spare wheel and other crap, plus running on 98ron petrol which is the only stuff this things runs on properly due to the high compression ration, and I am getting roughly 7 to 7.5secs 0-60. I raced a mgzr 160 with minor mods uphill and the zr only gradually pulled away after 80mph,also the iggy left the zr for dead aroud the bends. An awesome car, i must agree! I own a 2005 ignis sport, with a cat back scorpian exhaust, an induction kit a remapped ecu, strut brace and whiteline arb. It really does make a mockery of MUCH more expensive machinery! My friends own mini,s and vtr,s etc and the little ignis shows them its exhaust pipe around any twisty bits of road, it really does have an amazing chassis and really good mechanical grip, and can be hustled at a ridiculous pace with a confident and able driver behind the wheels, but its also happy in town or on the motorway (allthough does rev fairly high on the motorway @ 70mph) i think the person who called it \"a crappy city car\" obviously has not driven one, and probably hasnt even taken the time to look at the reviews of the vehicle! 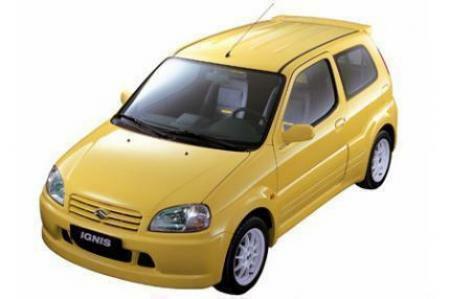 Skoda Fabia RS, Suzuki Swift Sport, Citroen C2 VTS, Ford Fiesta ST, VW Polo GTI\"
\"who care\'s? this is city boxed car... who cares about its 0 to 400 metters performance?\"
Hey Anonymous, then why look up this car if you dont care? Have you even driven one? And on track days you will see them overtaking much bigger hardware... Not defending it just providing the truth! if you push 2nd 8.4 is a realistic figure but might not give the best 1/4 mile time due to a 'late' shift! who care's? this is city boxed car... who cares about its 0 to 400 metters performance? Its not 0-60 in 8.9 its 0-62 in 8.9 which is after a gear change to third... if you push 2nd 8.4 is a realistic figure but might not give the best 1/4 mile time due to a 'late' shift!